New Delhi, 25th July 2018: Muscle health is often ignored since it is misunderstood as an area which is of relevance only to a sportsperson or a gym goer. Not many Indians know about its overall impact on health and wellness. Good muscle health is not only a key for an active lifestyle, but also for carrying out our daily physical activities to maintain a healthy life! 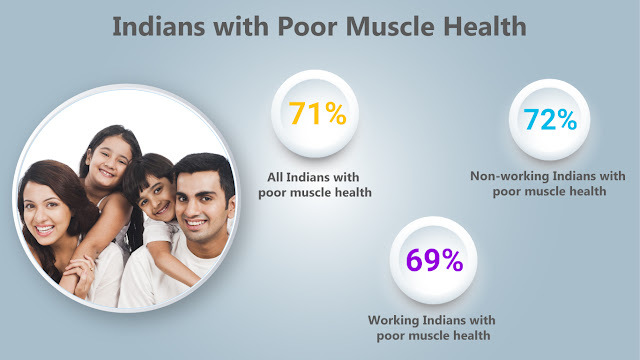 According to a recent nationwide study by InBody – a global leader in body composition analysis in association with IPSOS, leading global market and opinion research firm, an alarmingly large proportion of Indians suffer from poor muscle health. The study was conducted across 8 cities – Delhi-NCR, Mumbai, Kolkata, Chennai, Ahmedabad, Lucknow, Patna and Hyderabad. Covering 1,243 people, the respondents were a mix of working and non-working individuals between the age of 30-55 years. Statistics indicate that Lucknow has the highest percentage of males and females having poor muscle mass, with 82% of males and 80% of females. On the other hand, Delhi-NCR has a lower percentage of people with poor muscle mass, with 64% of both males and females. From the 8 surveyed cities, the data revealed that more than 70% of males and females in the age group of 30-50 need to gain more muscle mass. The study also analysed the body protein level and the trend was similar to that of the poor muscle mass levels. InBody is the global leader in body composition analysis with world class technological advancements. The InBody and its technology are FDA, Conformite Europeene approved and its results have been validated by around 2,000 research papers. The information from the InBody test allows for a personalized exercise and diet programs to maintain healthy lifestyles and is widely used in various research and professional fields such as NASA.